Let it be known, one of the most relaxing days I’ve had thru hiking happened on the Hayduke Trail! 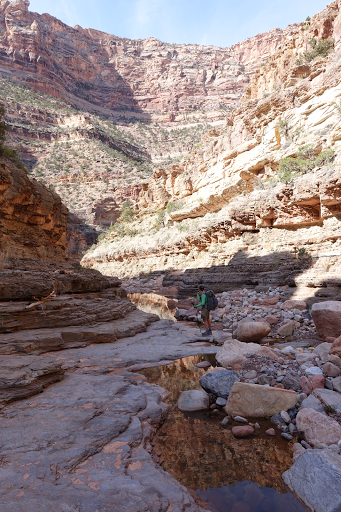 We got our regular 6:40am start and it was back into the deep sand of Dark Canyon. Neither of us slept well as there were strong wind gusts throughout the night on and off. We both wanted to take it easy today. Me with my recovering upset stomach and Katherine taking preventative measures to ease her finicky ankle into deep sand and steep climbs. We’ve had quite a start and are now 10 days in without a real break or overnight in a town yet. 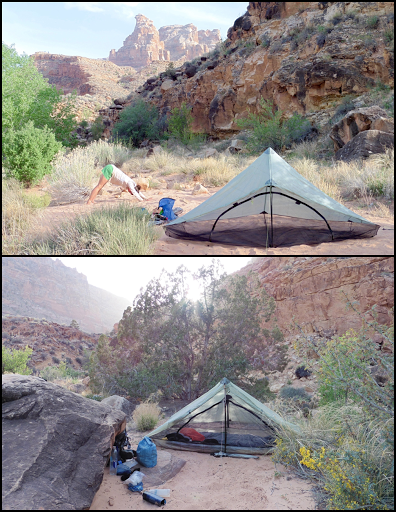 We did make a stop in Moab on day three, but then we did solid miles out with really heavy loads. Tomorrow, we will to hit Hite Marina to pick up boxes, but it will still be 15mi of hiking to get there and we will then have three more days until our first real town day and ZERO day in Hanksville. By the time we get to Hanksville, it will have been about 12 days since our last showers. That’s a record for me! 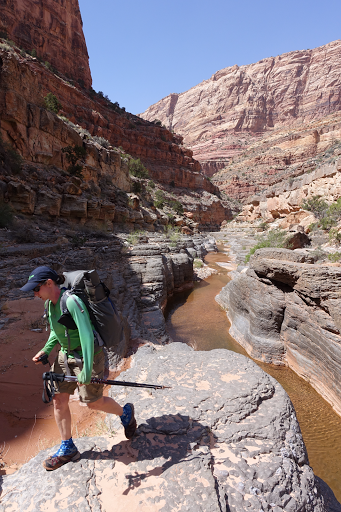 Today started off the with more of that deep sand dune sand as the trail crossed the wash of Dark Canyon back and forth. 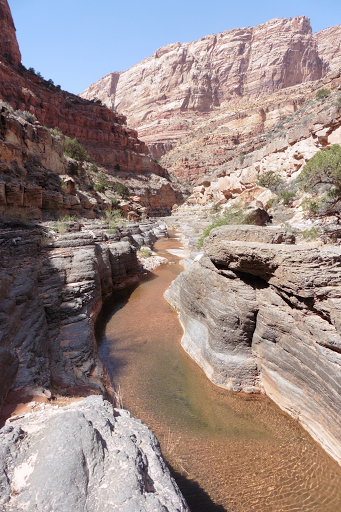 It’s hard to explain, but the wash winds and it would be inefficient to walk in the deep sand and winding wash, so there is a path that is sometimes less sandy that tries to parallel the wash just above it. 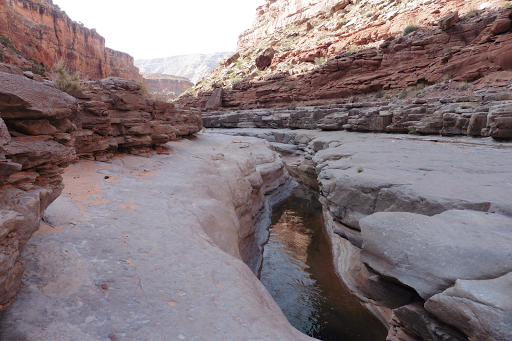 If the canyon bends(which it constantly does), the path will then cut across to the other side of the wash by diving steeply into the deeper sand and then rises just as steep back out. There was a hour or more of this this morning and I worried it would be a whole day of this in Dark Canyon. I had heard good things about Dark Canyon and I was a bit deflated by yesterday and this morning. Even though I was disappointed, it was a relaxed pace and automatic trail with minimal exertion compared to the rest of the Hayduke. I listened to the rest of Tracks this morning as we hiked in the sand and it was the perfect book to kick off this trail! Very happy with that one. By mid morning, we hit the part of Dark Canyon I’d apparently heard so much about. 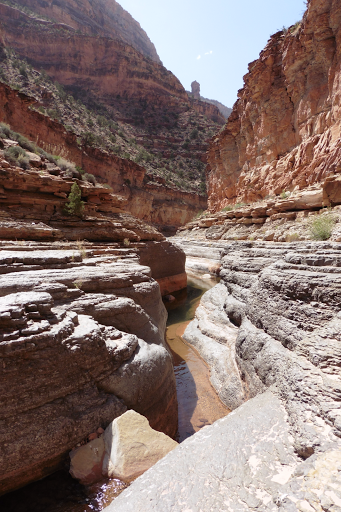 The canyon narrowed and there was less sand and more rock ledges for us to walk along. 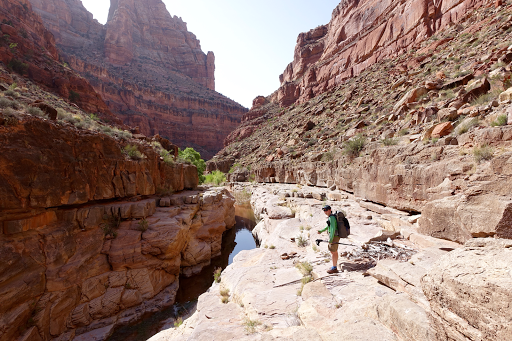 We just wound down the canyon all day and water was running the whole way, so we hardly had to carry any. We took a ton of photos and it’s hard not to pick all of them! There was a nice breeze, we were often in the shade, and the temperature was just about perfect. 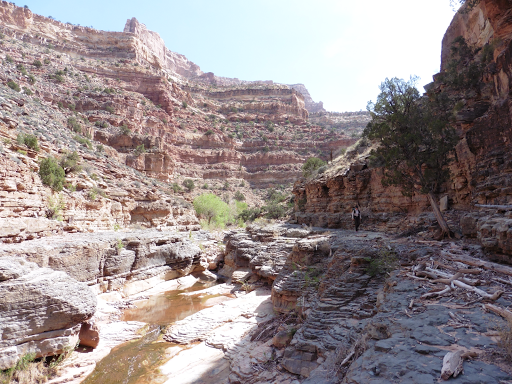 There wasn’t really a trail as the goal was to just hike up the canyon. We did have to cross the water at least 50 times to find safe ways to hike up stream, and it kept us at just under 2mi/hr pace, but it was really enjoyable. I liked the relaxed pace we were taking. 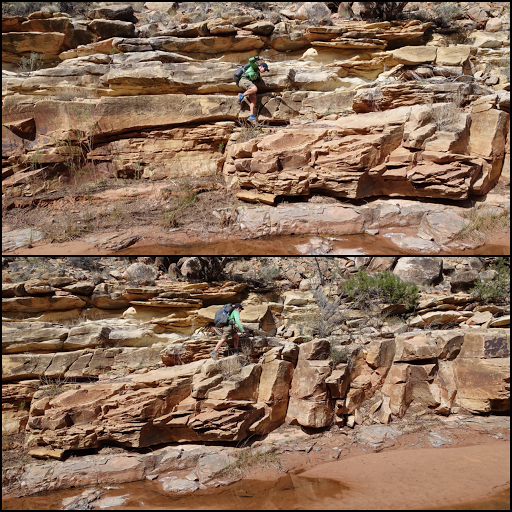 I’m pretty darn proud of my ease with exposure on ledges as I hike more and more. Only a couple things froze me a bit today, but most of it was really fun and it’s stuff I would have hesitated on in the past. Katherine got some action shots of me jumping down and hiking on ledges while she was on the opposite side of the canyon at one point. At lunch, we took a nice long break and cooked dinner assuming we were dry camping in the evening and I had 1/3 of my Mountain House that I couldn’t get down. My stomach is getting better, but just feeling stuffed and full easily. Can’t wait to get to Hite and dump all this cooked food I haven’t been able to finish. It has to be over a pound. It warmed in the afternoon and in the sunny spots, the clear water was very inviting…especially since it’s been a week since my last shower! We went for it and it felt great! 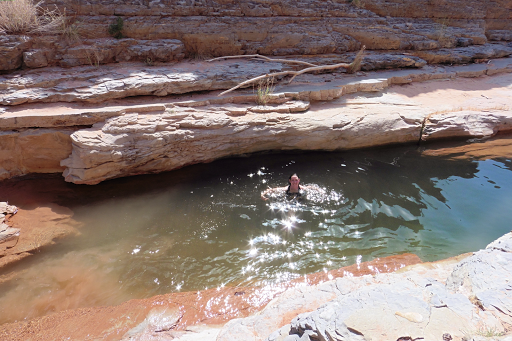 I never thought I’d see water clean enough to swim in on the Hayduke! It felt sooo goood! We ended the day with more beauty at every turn. Hard to believe I hiked along the edges of this stuff and it didn’t phase me!